Musicians from around the world have graced the Neumos stage, and many more will only ever dream of it. This Saturday, a group of teenage girls from across the state will get to live out that dream and rock out for their friends and family in the Girls Rock! Seattle Showcase. 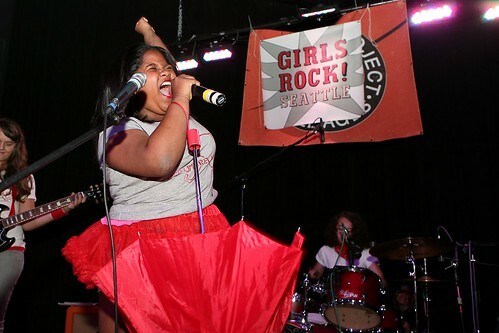 Saturday’s show is the culminating performance for the Girls Rock! Seattle Summer Camp, a weeklong day camp for girls ages 8-16. Throughout the week, the girls get a “crash course” in playing instruments, songwriting, audio engineering and stage performance. They attend courses in life-building and self-esteem, addressing issues like self defense and body image. The girls form bands on the first day of camp and work on original material throughout the week, culminating in a final performance for their families and friends on the Neumos stage. It’s a great opportunity for young women without any music background to try out an industry perhaps otherwise unavailable to them, and, Girls Rock! hopes, bring more women into the sound production and music industry. Anomie Belle is a local music powerhouse – she’s a performer, producer, vocalist and multi-instrumentalist. When she’s not in the studio, Belle collaborates with the VERA Project on youth advocacy projects, mentors film composing at Reel Grrls and is a Girls Rock! Seattle grantwriter. Her introductory class is an hour and a half long, called “Audio Recording and Electronic Music Production,” which received funding from the Seattle Office of Arts and Cultural Affairs this year. Belle hopes that the program will inspire young women to enter the field of audio engineering and production, or record their own electronic music. Girls Rock! Seattle is a non-profit organization fiscally sponsored by Reel Grrls. It’s modeled after Portland’s nine-year old Rock ‘n’ Roll Camp for Girls, which serves over 300 girls a year and has year-round events and projects. As Girls Rock! Seattle grows, they hope to add year-round projects, more summer camps and workshops to their roster, too. This year’s Girls Rock! Summer Camp is already exponentially larger than last year’s– they had to turn some girls away when they reached capacity. 80 girls are scheduled to attend. The Saturday Showcase event is open to the public and starts at 1 p.m. Tickets are $10, available online, and at Moe Bar. And if you’re a lady rocker over 16, well, there’s a Ladies Rock Camp for you. It runs August 27 – 29th at 7th Ave. South’s Theater off Jackson. Contact Girls Rock! for more information, to volunteer or let them borrow your gear for their projects.